One of the buzzwords that we’ve been hearing for years in the K–12 environment is iBeacons. Apple introduced iBeacons back in 2013, but to be honest, I’ve yet to see a killer use case in K–12. I’ve seen some discussion around the iBeacons used well in retail, hospitality, and sporting events, but even that hasn’t taken over the world. Wi-Fi vendors have been building in beacons into their access points for a couple of years now, and iOS devices have had the technology in it for multiple revision rounds, so I am left with the question: Where are the killer iBeacon use cases, and why aren’t we hearing more about them in real life deployments? This week, I’m looking at some potential ways that iBeacons can be used in K-12 environments. One of the challenges with iBeacons for K–12 environments is that iBeacons isn’t a product as much as it is a technology. Just as with Apple’s APIs like ClassKit, it requires additional work to include it in your products. Apple built the technology, but it’s reliant on others to build it into actual products. I’ve long been interested in iBeacons as a technology stack in K–12, but I am still waiting for a lot of my vendors to build out the platform. My devices (iPads) support it, my Wi-Fi vendor (Aerohive) supports it, but my software vendors don’t. You might be asking (and my vendors might be brainstorming) what I’d like to use it for, so I’ve been pondering ways that K–12 customers can implement iBeacons to automate parts of their school. Keeping track of student attendance is not a fun chore. Teachers have to do it daily, and it is a manual process. 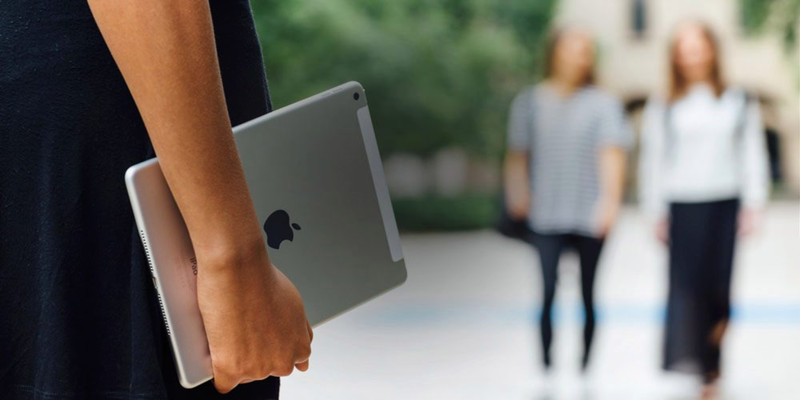 If you could tie an iPad to a student in a student information system, you could then trigger daily attendance tracking without the teacher having to manually track it. You may be asking yourself, students could certainly fool the system by sending their iPad in with another student. While that is true, it would be pretty easy to spot. The key to my deployment is that I would need the support of my student information system in order to make it work. The hallmark of iBeacons in retail is location-based alerts, and I think it can be a useful tool in K–12 as well. One thing I’d love to do is prompt users to install our school app when they enter the building. Our school app has our calendar, lunch menu, classroom overview information, and more. One of the pieces of technology at my school that I dislike the most is our access control system. The software application runs off of Windows, and I have to remotely access the machine to make changes. I also have to be on-site to program new cards. I’d love to move this application to a Software as a Service type system where the access readers are on our Wi-Fi. Another way to unlock the power of iBeacons is to leverage it for access control. Could we allow iOS devices to act as the “key” to unlock our doors? It would certainly simplify the process for users. My final idea for a K–12 use case for iBeacons is to have the ability to install certain mobile device management configuration profiles based on locations in the school. When we are doing standardized testing, I have to enable a configuration profile to lock iPads to single-app mode. I’d love to be able to trigger these profiles based on an iBeacon. My plan would be to install the iBeacon during testing week, and then the iPads would lock and unlock as needed. There are a lot of other situations where this could be useful as well such as disabling the camera when in a certain part of the school, etc. For all the promise of iBeacons, I am just still not seeing a lot of use cases outside of retail. I love the premise of the technology, and I hope that various industries continue to look at ways to implement it. I think Apple should do more to promote iBeacons as more than a technology. iBeacons in K-12 need to become a platform with turnkey solutions.